What do the Tour de France, the Giro D’Italia and a Gladiator have in common? A hundred years ago, bicycles were all the rage. Used by men, women and children, they allowed for quiet, individual travel anywhere, at any time – and it seems that everyone who was anyone had at least one two-wheeler to get them wherever they wanted to go. Whether it was the Belle Epoque beauty of Alycon Cycles or the Art Deco lovely of Dion Bouton, women were cycling in droves – either to get where they were going, or perhaps to get away from places they had no desire to be in the first place…. 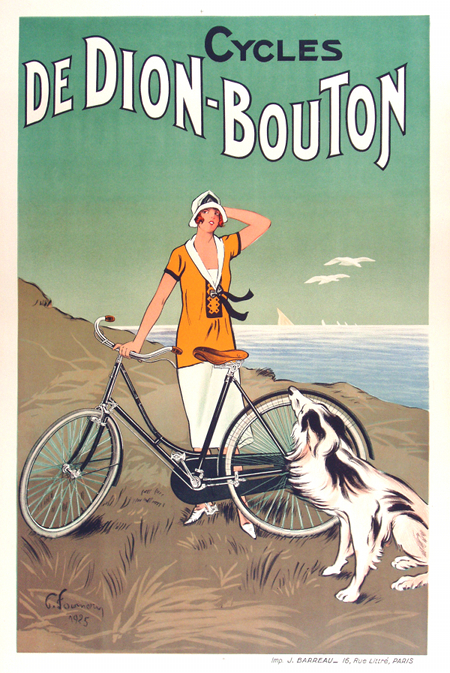 Look at the unescorted beauty at the beach in Cycles Dion Bouton – no man, a relatively short skirt, a bicycle she would have had to ride astride (horrors!) and only a dog to keep her company. Yes, it’s a beautiful Art Deco poster, a classic in fact, but what it shows us is how far – literally – women had come. Now millions of people all over the world can watch the winner of the Tour de France come into the Champs Elysees from a teeny-tiny camera mounted on the top of his helmet, while thousands of on-lookers wave him on to victory. The Giro D’Italia fans are amongst the most fanatical on the planet, lining the race route and championing their hometown boys like only Italians can …. 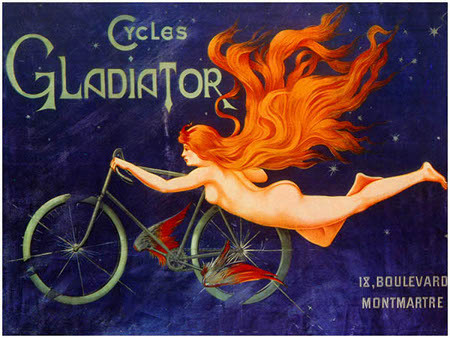 Although I bet that if a naked woman riding a Gladiator bicycle entered either one of those races, even the most ardent fan might be convinced to switch allegiance. To feel just some of the excitement of the Giro D’Italia click HERE!